Where is project management going in the next few decades? Being able to look at current trends and see where they will take us is an interesting and thought provoking exercise. It might even allow us to get ahead of the pack and put our project management practices a decade ahead of our competitors. This article looks at a five current trends – some of them only just emerging – and looks at where they may take us. Tools such as scheduling software, risk management tools, issue management tools and testing tools to mention just a few. The tools need to integrate, and provide a suite of automated solutions that will streamline project management. Procedures for undertaking projects. I purposely avoid the word “methodology” as it has connotations of bureaucracy and doing things for the sake of complying with some generic corporate process. Procedures will be much more flexible and customisable. The procedures will apply at a much lower level than the methodologies of the recent past. For example, there may be procedures for setting up a project of a certain size. Techniques. Techniques are a pre-packaged small procedure that can be repeated across many projects. It usually involves some tools and materials which assist the completion of a task. For example, our company has a technique called “Method H” for managing the outcome of requirements interviews. It includes some instructional material and a piece of software to collect requirements in a structured manner. There are lots of these techniques around A Project Infrastructure Specialist will be able to find the right ones for the organisation and ensure people are trained in the technique. Templates. Templates are a traditional collection device for projects. They are both a place to put information, and a checklist of what needs to be addressed of reviewed. Unfortunately in many organisations there is no control over versions or modifications. Training. Training on projects is typically provided as Project Management training. We also need to look at Project Participant training and provide standardised training for everyone on a project. This role is different to the existing role of the Programme or Project Office. Those roles typically have a focus on the progress and reporting of existing projects. The project infrastructure role will have a focus on building the framework within which projects operate. Getting the planning right in a project is always going to have a major positive change to your chances of success. If we focus on the 10% to 20% of the overall project to get it set up properly, the remaining 80% to 90% will require less effort to manage. My prediction is that it won’t be long before we have “Setup Specialists” within an organisation who will work with the Project Manager to get the establishment right. The person who helps with the setup will be skilled in knowing what activities need to be planned, how to sort out roles and responsibilities, what risks are likely to arise, and how to ensure the project has every chance of success. The Project Establishment specialist may be from within the organisation or be an external consultant brought on board for a few weeks. I recently carried out such a role for a law firm who were about to embark on a replacement for their existing practice management system. The result was that we split what they saw as a single project into five separate projects and avoided what could have been an unwieldy and costly exercise. We identified roles where there was nobody to fill. They brought in external resources that could fulfil these roles. We identified a number of risks that have now been addressed. We took control back from the Vendor who would probably have made many times the cost of the software in consulting fees. Most importantly, everyone from the top management down now feels the project is under control, they can see where it is going, and they know what part they will play. An added bonus is that going through the process is a great training experience for Project Managers. It sets them up well for future projects. It also means that you don’t need as highly skilled people to manage the projects. Much of the skill required by a Project Manager is to get the initial plan in place. While there will be challenges, most of the ongoing work is actually managing the project against an established work plan. A similar role to the one above is likely to emerge, and has already emerged in some organisations, to do regular audits on projects. In one organisation I have worked with, they have a super skilled Project Manager working full time on auditing existing projects. About every three months, the project is reviewed to ensure it is still on track to meet agreed objectives. Some of the things discovered are basically poor control issues. These may be risk registers not being kept up to date or schedules not reflecting variations to the project. Others are more serious. They might include benefits that will no longer be delivered or unapproved scope changes. The auditor will be an experienced Project Manager who has full access to project records and personnel. They will have a checklist of things to review (possibly prepared by the Project Infrastructure Specialist). Reporting will be to a Programme Office, Sponsor, or Senior Executive Team. This is one of the most exciting aspects of the future. A project is in fact a business process. The difference to a normal business process is that it is less consistent. Each project is a modified version of a generic project management process. In one project, you might have a scoping workshop as a business process. In a smaller project, it might be a single interview with a Sponsor. 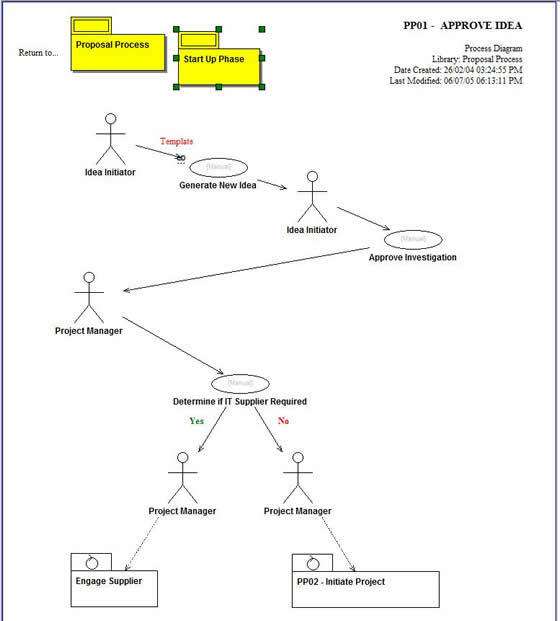 Given the proper business process mapping tools, a project workflow can be assembled from a series of pre-packaged components. The example below was a concept process developed using Holocentric Business Modelling tool. It relates to how a project proposal progresses. The first image shows the phases. It also provides a number of links to provide further information such as an overview of governance on the project. By clicking on the “Start Up Phase”, you can see the major steps involved in the phase. If customising for a particular project, you might decide to delete the “Initiate Project” step. By starting with a standard template, you can create your project workflow and add or delete components. We have now drilled down to the “Approve Idea” process which is where the real information exists. At this level you can attach templates, reference documents and links to particular pieces of information. You can see a template hyperlink for “Generate New Idea”. The project knowledge for the organisation is contained at the next level. 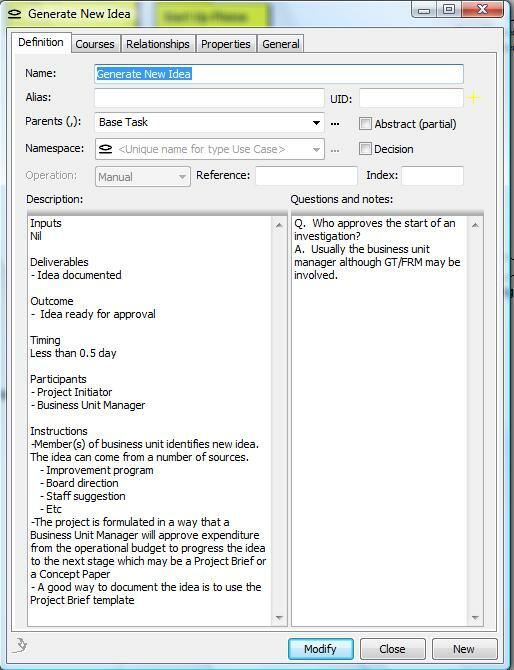 If I am a Project Manager and don’t understand what the “Generate New Idea” is all about, I can click on the task and find out all about it in the next screen. The organisation can store its accumulated wisdom in the template. The example above is only a concept developed for a client to show how it could work. Presentation can be significantly improved particularly as Holocentric now have a much more versatile tool available that enables much more flexibility in layout and design. You can also generate a web site from each project and put it on your Intranet. Each of these components had a library of information and templates attached. 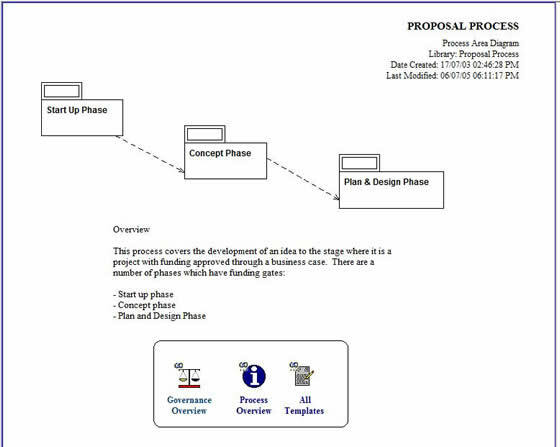 Once you set up your business process you then have a custom plan for running your project. It is like a Lego project methodology. The final prediction is driven by the need to eliminate duplication in documentation. Take any completed project and see how often the project objectives were documented. They might be in a concept document, a project charter, various presentations, requirements documents, implementation plan, training materials etc. Whilst it is a waste of time and effort to continually re-document the objectives, the really scary part is that they morph. The objectives start off as one thing and gradually change to something else. I remember doing a review of a completed project for a company a few years ago. The initial objectives in the approval document for the project to proceed were totally different to the objectives in the implementation training. It was impossible to review the success of the project as it was never clear what the project was trying to achieve. Project Objectives, like many other pieces of information should only exist in one place. Ideally this is the Project Charter or Project Plan which is consistently reviewed and updated. The updates should of course be approved and tracked. Some examples of often repeated information are Business Problem, Outcome, Deliverables, Roles and Responsibilities, Key Milestone Dates, Stakeholders etc. Some years ago I did some work using the Master and Subdocument feature in Word. While it was cumbersome, it did allow us to have a number of documents that could be combined into other documents. For example, we had the Project Objectives as a subdocument which could be incorporated into any other documents where objectives were listed. Word is not the best tool but one day someone will develop a facility to store the key information in such a manner that it can be plugged into documents easily. It will also keep a history of changes and the relevant approvals. I am sure someone could develop it in SharePoint for example. To date, 6 people have rated this article. The average rating is 4.33 - Add your rating. Just select a rating and click the button. No other information required.